Editor's note: After this story was filed, Mary Boyer passed away at the age of 93. Mary Boyer can remember the exact moment she became a Prince fan. It was July 1984 -- weeks after the release of his groundbreaking LP, Purple Rain -- and a friend invited her to see Prince's ambitious movie of the same name. Incredibly, Boyer was the only person her friend could find to tag along to the theater. "As soon as [Prince] came on [the screen], my heart just went [makes whooshing noise], and I said, 'I know this guy. I just know him,'" recalls Boyer today. "By the end of the film, that was my guy." Boyer was no teenager experiencing her first taste of idol worship. At the time she saw Purple Rain, she was 60 years old. "I didn't intend to be a collector, but if I went to a store and there was something there with Prince, I just couldn't leave it." Buying that movie ticket unwittingly changed her life, transforming her into one of Prince's biggest fans. Over the next few decades, the mother of seven saw the Purple One 25 times, in far-flung locales such as New York, Detroit, Chicago, Canada, and his home base of Minneapolis. 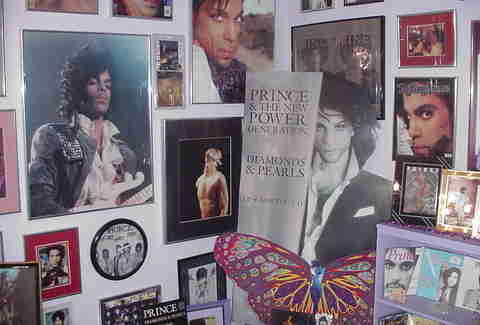 In her sprawling house in Cleveland, Boyer even had a dedicated Prince room -- with walls painted purple, of course -- crammed full of memorabilia related to the icon. Photos, magazines, vinyl, posters, CDs, pins, laminates, promo swag -- you name it, chances are Boyer had it. At the peak of her collecting, she had 300 different posters, 100 different T-shirts, and more than 1,200 unique albums in every format. 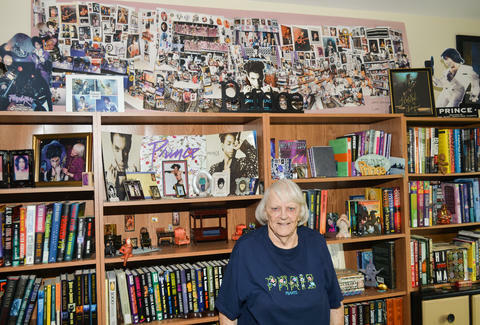 "I didn't intend to be a collector, but if I went to a store and there was something there with Prince, I just couldn't leave it there," she says. "I bought it, and pretty soon, I had quite a bit of stuff." After her kids moved out, all of that "stuff" found a home in one of their old bedrooms. "We painted it a light purple, and I just started filling it up." She laughs. "I loved everything I put in there. I was very, very happy with it." Now 93, Boyer is sitting in the living room of her apartment on the outskirts of Downtown Lakewood. The space is cozy, filled with cherished art, knickknacks, and photos she's picked up over the years. Boyer is fond of collecting things besides Prince-related items -- miniatures, as well as Egyptian and Oriental art, are interests of hers -- although she's downsized her belongings considerably. In the spring, she moved from that giant old house into this current, more compact space. Scattered here and there, however, are references to her devotion to Prince. 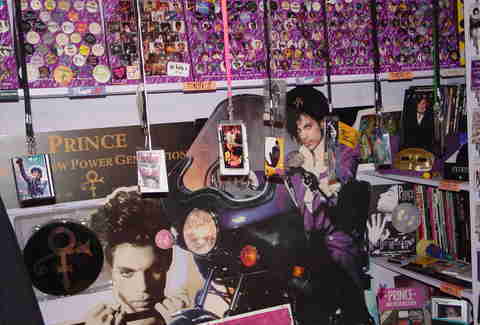 A coffee mug featuring variations of his visage is within arm's reach, near a photo book filled with Prince photos. 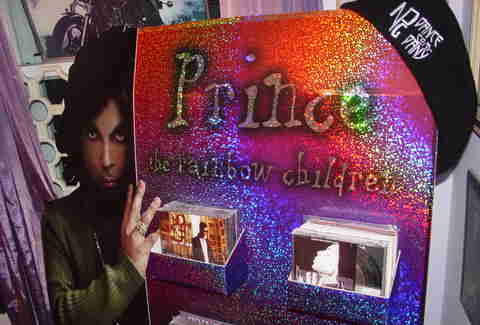 A glossy, soft-glow snap of late-era Prince stares up from behind glass on the top of a nearby desk; a business card from the long-closed, Minneapolis-based New Power Generation, the Prince-owned retail store, is also tucked away. 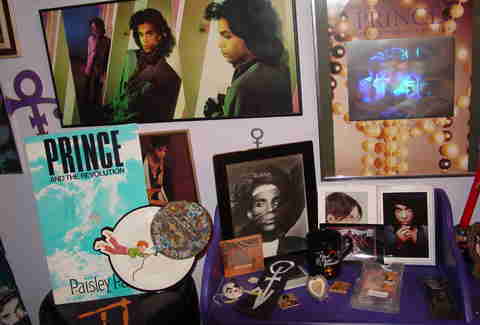 In a nearby hallway is a media rack with several shelves of Prince bootleg DVDs, while in her bedroom is a panoramic photo of the Prince room at its most impressive, along with some of the meaningful tokens she kept -- including a cardboard Purple Rain die-cut stand-up and a healthy selection of framed photos of all sizes, spanning the artist's entire career. "Take a look around you, at least you got friends"
Also visiting this steamy Friday afternoon in August is Dennis Roszkowski, a photographer and long-time Prince fan from Westland, Michigan, who often visits Boyer and helps out at a local library's events. The pair met in 1989 because of their shared Prince fandom -- an organized, meticulous person, he once cataloged Boyer's memorabilia so she knew what she had -- and remain close friends. 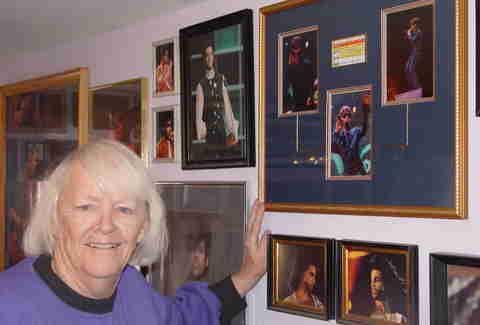 Boyer amassed her Prince collection by visiting local record stores, where she would sometimes find promo vinyl dumped by radio DJs, or by attending record conventions. 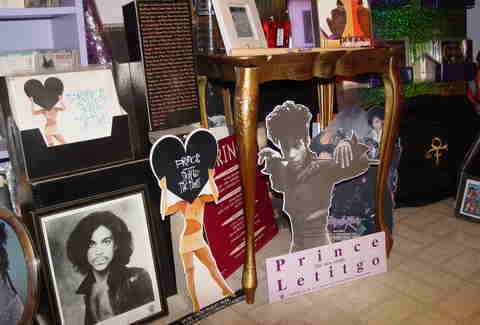 Employees came to recognize her and her obsession, and would sometimes save special items for her, such as a life-sized cardboard stand-up of Prince circa the 1991 LP Diamonds and Pearls. In the mid- to late-'90s, Boyer and Roszkowski would also attend regional Prince Fests -- more or less gatherings of diehards to celebrate the artist -- and sell duplicate albums, as well as trade for things she didn't have. They saw Prince four times in 75 hours. Along with others from the fan community, the pair also attended many Prince concerts and special events: the week-long Prince Celebration at his studio/compound Paisley Park in 2000, appearances at his one-time Minneapolis nightclub, Glam Slam. At one point in 1993, they even saw Prince four times in 75 hours. 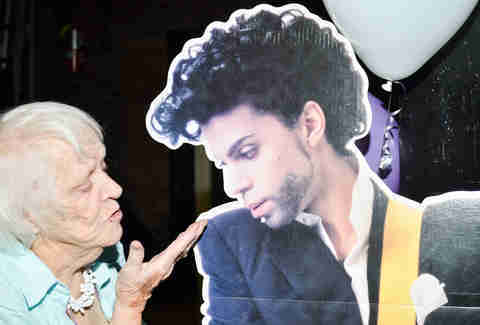 Boyer often expressed her admiration for Prince in more direct ways. "She would send letters to Paisley Park for years, and she would send little gifts to Prince," Roszkowski says. "And she would enclose a checklist with a self-addressed stamped envelope [that] said, 'Did Prince see this?' and 'Did he like it?' and they would check off 'Yes, he liked it,' and send it back. She had this connection with them." Boyer and Roszkowski say that one-time Prince manager Gilbert Davidson and half-brother Duane Nelson (who handled security) were aware of her fandom, and always treated her kindly and with respect when they crossed paths. Although Boyer once had the chance to get a behind-the-scenes tour of Paisley Park and attended shows there, she never actually met and had one-on-one time with Prince. The closest personal experience she had was at an April 1993 after-show at Chicago's Metro, when the artist pulled her up onstage during the first encore. "He was doing his show, and all of a sudden, towards the end, he said, 'Turn the lights on,'" Boyer recalls. "He said, 'Whose grandma is that down there? We gotta get her up here and have her shake her doodle!' or something like that." Boyer laughs. "And then he sang this song 'Johnny' -- it's a little risqué, shall we say. And I know he did it to see if it would embarrass me a little. Then during the song, I was supposed to sing this 'oh-oh-oh-oh' [part], and I didn't do it very good. "And he gives me that look," Boyer continues, referencing the sassy, quasi-exasperated glance for which Prince was known. "I hit him on his arm, and he had me do it again, and I did it. And he just laughed and then gave me a big, big hug. And I was so happy. I just wanted him to know that I really liked him. It wasn't that I had to be seeing him all the time. But you know how you want somebody to know that…"
They mean a lot to you? "Yeah," she says. "That was a high moment in my life." "I only want to see you in the Purple Rain"
Born in Fargo, North Dakota, Boyer and her family moved to Lakewood when she was a toddler. She grew up there and went to Lakewood High School, which is where she met her late husband, Jim. She was a member of a sorority; he was a member of a fraternity. One afternoon, the pair happened to see each other at a local ice cream store. "I was in there talking to some guy, and Jim came in," Boyer recalls. "And the guy said to him, 'Do you have a date for the Friday night dance?' And he goes, 'No.' [The other guy] says, 'Why don't you take Mary? She's a lot of fun.' And he says, 'Do you want to go?' And I said, 'Yeah.' Because he was real cute." Music entered her life after the couple started having children. Her second-oldest son, Wink -- who "was a hippie, shall we say," Boyer says -- introduced her to Jefferson Airplane's Surrealistic Pillow. That LP changed everything. From there, Boyer started embracing the then-new music of the day, such as Leon Russell and the Rolling Stones. She also started going to shows, among them, Neil Young, Crosby, Stills & Nash, Elton John, and David Bowie's first US concert. "I was the cool house," Boyer says with a laugh. "That's probably why it was easy for me to get into Prince. It wasn't like it was strange, because I was used to going to concerts. We did go to a lot of concerts, and my kids, of course, thought I was a 'cool' mother." Jim was also 100% supportive of Mary's Prince fandom, which may have surprised some. "[People would say], 'How come it doesn't bother you?'" Boyer says. "[And he said] 'I'd rather have her doing that than sitting around crocheting something.' He liked the idea that I had young friends, because he didn't like to do a lot, except play golf. He didn't have to entertain me, because I was doing my own entertaining." Incredibly, however, in recent years, Boyer has sold off and otherwise given away a large portion of her Prince memorabilia. Even stranger, "it didn't bother me at all," she says. In part that's because she's been preoccupied dealing with health issues, and uses oxygen as she gets around. ("I hate it," she says vehemently about that.) But Boyer also has the remarkable personality trait where she's able to switch gears and hobbies on a dime -- and never look back. "I have this kind of a life where every 10 years, I changed," she explains. "Until I was in my, say, 40s, I was a mother, and never went anywhere. In my 40s, my husband and I started to go out square dancing. We did what they call challenge, so that you had to go to workshops and stuff. When I hit my 50s, I went to [local community college] Tri-C and took classes in astrology, and I became an astrologer. I was that for 10 years -- doing readings. And then I went to a Prince movie -- that changed that, and then I gradually stopped doing official astrology things. "Every time I changed, I dropped the other thing almost completely," Boyer says. "That must be why when I was ready, getting tired of everything I had -- why I was able to do it." "And no regrets," adds Roszkowski. "You brought your favorite things here." "Life is just a party, and parties weren't meant to last"
In an odd coincidence, Roszkowski was helping Boyer move out of her house and into her apartment on the same day news broke that Prince had passed away. He recalls that his hands were shaking as he set up his laptop to read more about the news. "Mary looked at me and said, 'What's wrong?'" Roszkowski says. "And I said, 'Mary, Prince just died.' And I just remember her saying, 'I always thought that I would be in heaven before Prince.'" In the background, Boyer chuckles slightly. The mood in the apartment turns reflective, as Roszkowski ruminates on the reactions he and Boyer received from people they had met because of his music. "The amazing thing about that day, is that all Prince fans that we know, we just started hearing from people we hadn't heard from in years," he says. "Every Prince fan can tell the same story: they know where they were when they heard, and how they were feeling. Everybody's phone just blew up -- people started calling, sending text messages. 'Oh my god, have you heard the news?' It was such a surreal moment. "We relied on phone calls that we were getting from friends," he adds. "And consoling each other, and trying to figure out, 'Wow. What's the world like without Prince?' Because you just can't believe it.'" Roszkowski's thoughts summarize the unique impact of music fandom: people bond over their love of a certain artist or band -- seeing shows together, chatting online, sharing stories, maybe swapping bootlegs -- and seamlessly translate this connection into real-life, deep friendships. 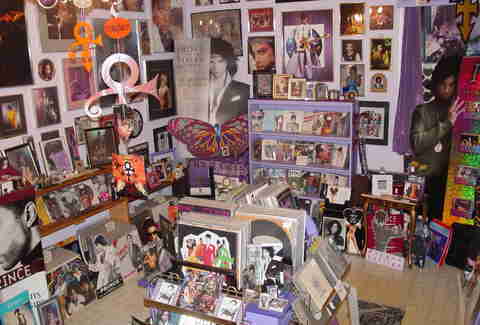 The Prince fandom is especially dedicated, however. In fact, Roszkowski says it was "meant to be" that he and Boyer happened to be in the same city on the day of Prince's death, as it was symbolic of the treasured connections facilitated by his art and music. "What's the world like without Prince?" "His concerts were unlike anything you saw," Roszkowski says. "You'd go there, and there was just a whole mixture of people -- ages and races -- and everybody just got together and had a wonderful time. It seemed like the Prince world was a great melting pot of people. You wished the whole world could be together having a good time, and peaceful. "That's not what the world's like, in many respects. It is if you look for it; you can find it. And we found it with Prince. There was a connection with him that brought us all together, and we always talked about, 'Wow. Look at what we did -- together.' Just my friendship with Mary, between the two of us, what we've done, is fantastic. I'm grateful for it every day." Boyer quietly chimes in. "I have to say, I've had a very happy life," she says. "When I was being the mom in my 30s, I loved it; when I was square dancing, I loved it. When I was in astrology, I loved it. When I [was into] Prince, I loved it." And Boyer has her own take as to why there is such an intangible (but enduring) bond between Prince fans. It's not complicated -- but it's a theory that's as playful and laconic as the Purple One himself. "We're all smart," she simply says, with a laugh. "As my daughter said, 'Mom, I’m glad you're smart enough to know [Prince] was a genius.'" Annie Zaleski is a writer and editor in Cleveland. Follow her @anniezaleski.